A couple months ago I came across this post on skin care diaries.Since I am someone who is always going through skin care products I thought keeping a skincare diary was a brilliant idea, so I made one. I used the Memebox notebook that I received in a Memebox (btw what happened to them?) 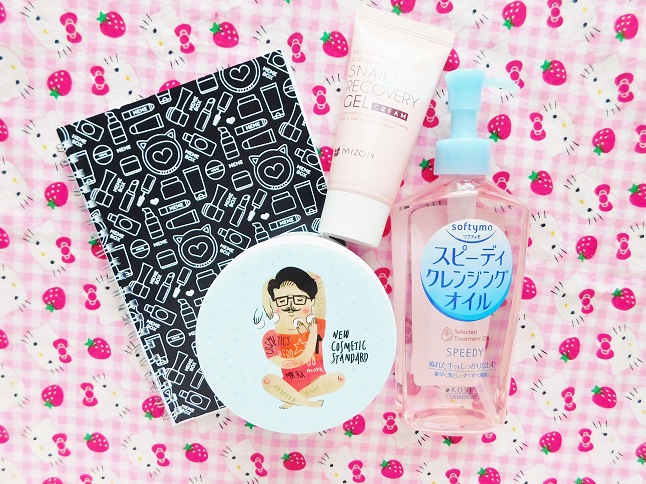 since it has a bunch of illustrations of skin care all over the cover. Today I will be showing you how I setup my skincare diary and what I'm using. On a fresh piece of notebook paper, I write down morning then skip a couple lines and write night, to indicate my two routines. Next, I write all my steps for each routine. 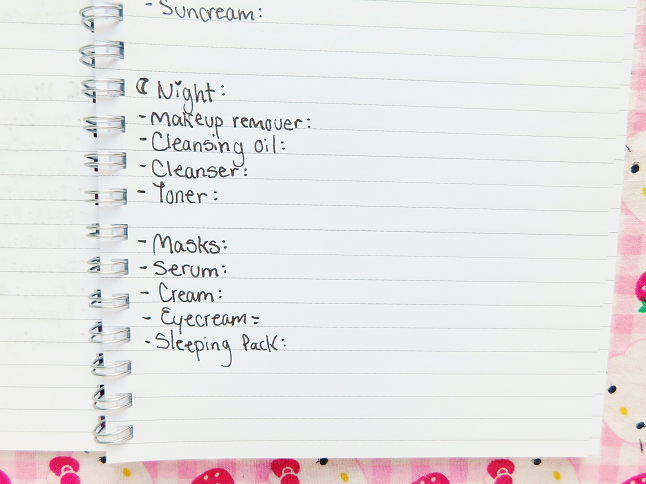 You can either write down steps 1-whatever or do what I do and write the separate skin care steps such as essence, serum, cream, sheet mask, etc. Now time for the fun part, filling in all the skincare products! Here is what my notebook looks like when filled with the products I am using at the moment. I also wrote the date there on the top of the page to remind myself what I was using at that time. This is also great for when you break out and want to know what caused it. Whenever I started using a new product I will start a new page. 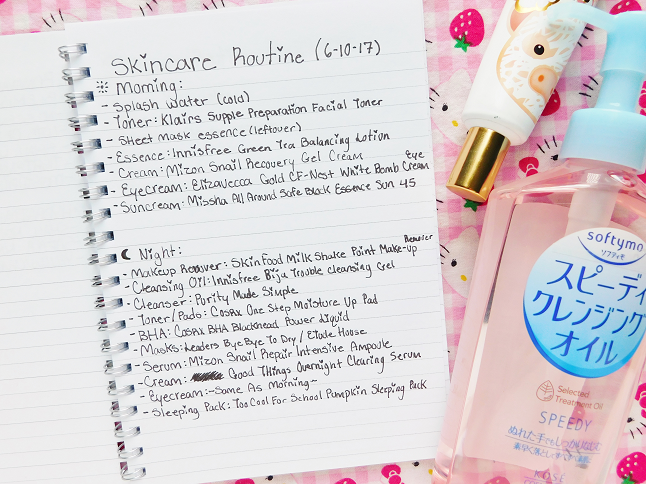 I didn't include my previous pages (because I forgot) but I also highlighted and marked which products I loved and would repurchase and ones that I didn't like. 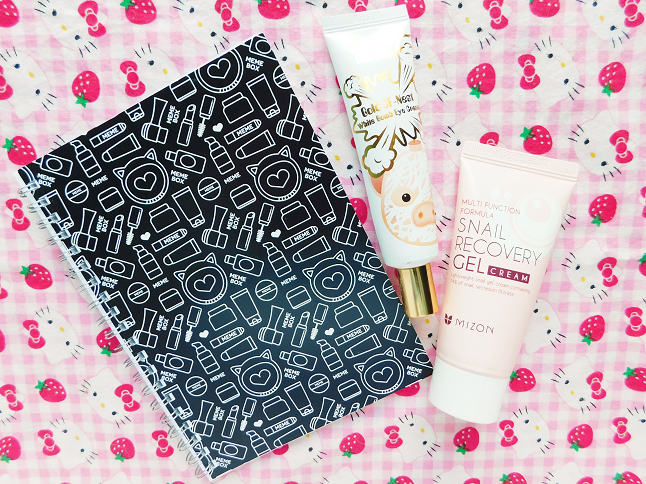 If you are someone who uses lots of new skincare products then I would highly recommend you start journaling your routine in a notebook or add a page in your bullet journal. This is an interesting idea. While I don't try too many new products at once, I do want to start trying new sheet masks, so this would be a good idea to keep track of which ones I like. Thanks for sharing!